What are the biggest trends impacting commercial office markets? This particular report takes a deeper look into commercial office markets in 2014. It includes an outline of key markets to watch this year and beyond, and provides some key statistical trends that may impact your investments. 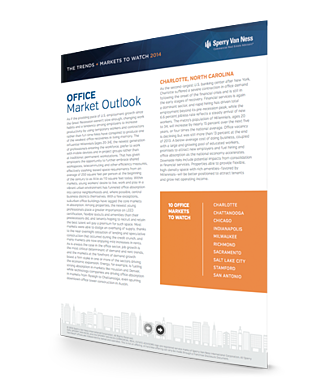 Download Chandan's Office Market Outlook to learn more about all of the key industry trends that are impacting the commercial office market. How economic patterns are influencing various markets across the country. A breakdown of key statistics, including asking rent and occupancy rates. US markets that are poised for potential growth in the coming years.